Move over, Robocop. Robofish is here. It sounds like science fiction - but robotic fish are here, and their high-tech capabilities are helping scientists pursue some vexing questions. Michigan State University researchers have received funding for a new project using robofish, to figure out how native lake trout are rebounding, after decades of decline. Xiaobo (pronounced shaw-bo] Tan is an associate professor of electrical and computer engineering. "The wings are used to facilitate a gliding motion," says Tan, "and the tail of course is used to swim and also to help manoevre the fish, especially in difficult environments." Tan says it's long been possible to tag fish with devices that emit a sound - and track them from a boat or from shore. But the signals can only be detected at a certain distance. Once the fish heads to deep water, it's very difficult to track. But the robofish will be able to go wherever the lake trout go, and gather data on where they eat and spawn, and other species they interact with - including invasive lampreys (boo, hiss). The project envisions that one of the robofish will stay on the surface, sending data from the other robofish to the Cloud, using basic smartphone technology. The other robofish will follow the tagged trout. 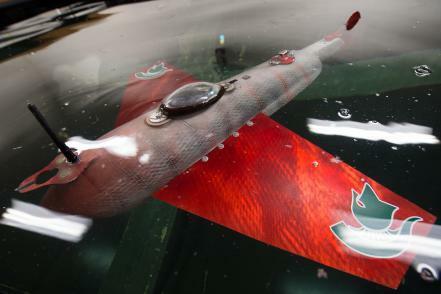 "They will be equipped with acoustic micro-modems - which means, basically, just like a submarine, they can talk through acoustic signals underwater," says Tan. Tan's team will design and build the robofish over the next three years, launching them in year four in Thunder Bay in Lake Huron. Another MSU project, ongoing, is using robofish to study harmful algae and cyanobacteria blooms.